About the only thing on a DTR that could accidentally break is the nylon screws. This could happen if the DTR is dropped just right and lands on the screw head. Although this is a rare occurrence it could happen. 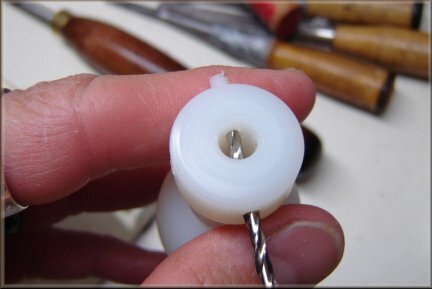 Use a small enough drillbit so that you're not going to drill the threads on the opposite side of the broken screw. As the drillbit turns clockwise it will unscrew the broken nylon screw on the other end. If for any reason you would rather have me extract the screw I will do this for free and send the DTR Bell back to you also for free. All you would have to do is pay the shipping to get the DTR Bell to me. 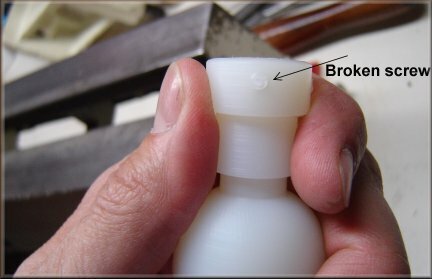 Although this is a rare occurrence, Fixing a broken nylon screw is not difficult to do. To remove the screw I use a small drill bit that is inserted on the opposite side of the broken screw.